The modern landscape for manufacturers has opened an entirely new opportunity for growth. And because most industrial manufacturers are just beginning to adopt methods of reaching operational buyers online, the sky is the limit… your chances of reaching them first is overwhelmingly in your favor. Only 30% of manufacturers say they are effective at creating and distributing valuable, relevant and consistent content to attract and acquire qualified prospects and leads. The key is to develop an effective strategy for generating sales in manufacturing – this can be done through strategic content marketing. Read on for manufacturing marketing tips – the good, the bad and the ugly. New organizational buyers are looking for the manufacturing products you have to offer. In fact, they’re online using search engines right now trying to find your industrial marketing organization! When you generate web content through blogging, downloadable content offers, social posting and link this key word dense content to a clear, concise call-to-action, you have taken the first step to generating qualified new manufacturing sales leads. Plus, tactics like SEO, blogging, social media, website lead generation and lead nurturing are more cost-effective than traditional forms of marketing. The more pages you have indexed on your website, the more qualified sales leads you have the opportunity to reach. 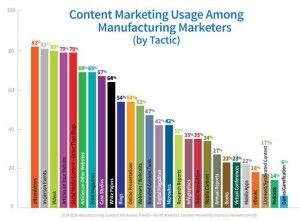 There are over 47,000 manufacturing companies in the United States, and over half of them have said they’re in the process of increasing their content marketing spend over the next year. 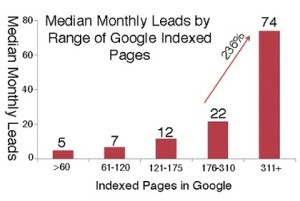 In fact, the average budget spend on company blogs and social media has doubled annually since 2009. If your competition is properly integrating content marketing and optimizing their web presence and you aren’t, they are going to intercept prospects before you will. Marketing for manufacturing cannot focus strictly on trade shows, industry magazines and networking to gain the business they’re trying to reach. New organizational buyers are seeking solutions online, and manufacturing companies cannot afford to avoid focused, effective online participation. By now, you understand the need for content marketing for your organization, but are perhaps seeking manufacturing company marketing tips. If you’re looking for ways to optimize your online content and generate sales-ready leads, download our free ebook by clicking the link below… or simply give us a shout.